Today is the last day of sale of the MacUpdate bundle so if you want to get it, it is your last chance... Link to the bundle here. 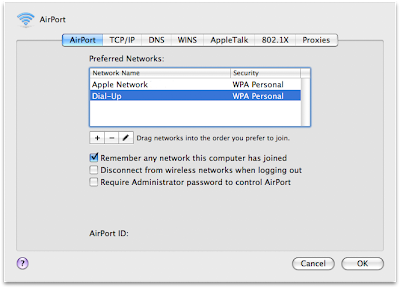 It is possible to set your Mac so that it shares a wired internet connection over WiFi. So it really lets you use your Mac as a wireless router. 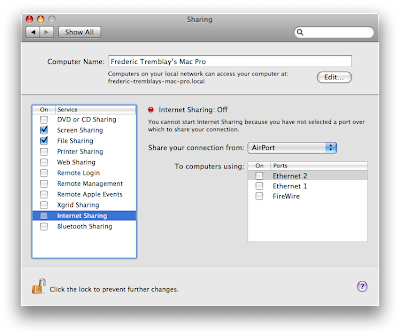 It is so useful to share wired internet over to another Mac or to an iPhone (or iPod Touch). 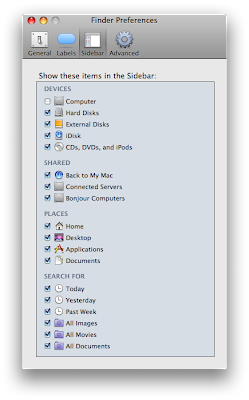 You can enable it in the sharing section of System Preferences. The game Neon Tango was just added to the bundle. If you already purchased the bundle, you should receive your serial number soon. Link to the bundle here. It is possible to adjust the contrast on screen using a rather complicated shortcut. 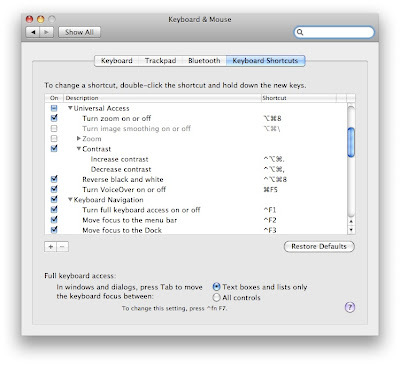 The info about the shortcut is located in the Keyboard Shortcuts section of System Preferences. The shortcut to increase contrast is "Ctrl - Option - Command - . ". Decreasing contrast is done with "Ctrl - Option - Command - , ". Some cell phone (like some NOKIA and LG) and some Pocket PC or smartphones (HP or HTC) adds GPS coordinates automatically when taking a photo (only if supported by the operator). 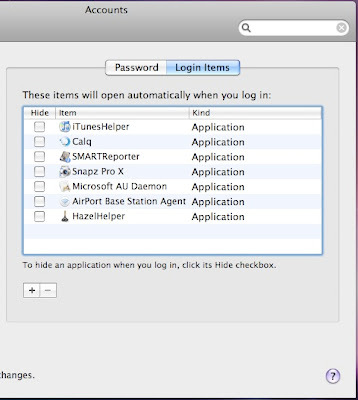 In Leopard, you can access a list of all applications that open at login in Accounts that is in System Preferences. From there you can also choose if you want a specific application to automatically hide as soon as it is loaded at login. This is very useful for instant messaging applications (MSN, Skype, iChat, etc) that you want to always have running in the background. 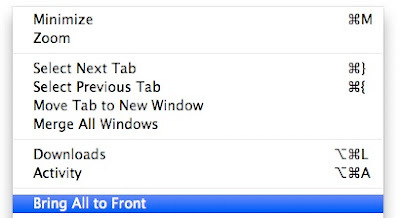 In the dictionary included with Mac OS X, there is a feature called "Front/Back Matter" in the Go menu. This really completes the "dictionary experience", offering what traditional paper dictionary all have. From there, you can access a bunch of guides with relevant information. 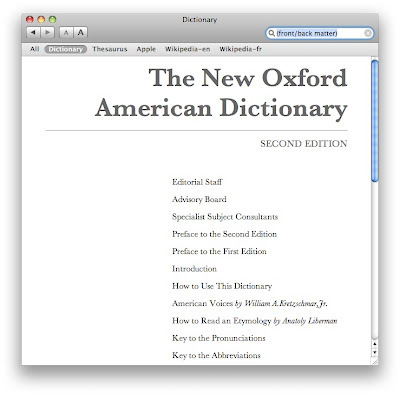 The feature will only be accessible when you are in the dictionary and not in the thesaurus. BannerZest has just been unlocked and Parallels Desktop will be at 6100 bundles sold. You can learn more about the bundle or buy it here. Sound Studio is now part of the MacUpdate bundle. We also now know that BannerZest will be unlocked at 4600 bundles sold. You can get more info about the bundle or buy it here. WhatSize is part of the bundle for the first 3500 sales! There is an additional incentive to buy the MacUpdate bundle early, it was now announced that WhatSize will be included in the bundle for the first 3500 sales. There are now nearly 2500 bundles sold, so don't wait if you want WhatSize. More details about the bundle or buy it here. 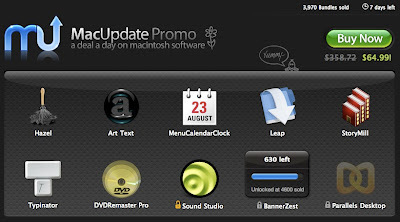 Leap is part of the MacUpdate 10 applications bundle (learn more about the bundle or buy it here). Leap is the kind of application that I had no idea I needed, but once I started using it, I started referring to it every day. I think the standard Spotlight is great for a quick search, but Leap is so much more advanced. It is hard to describe exactly what it does, the best way to understand is simply to check out the trial. 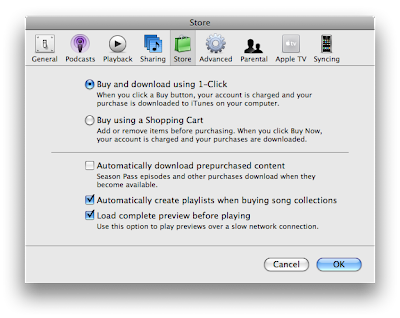 Apart from that, the interface is very nice and it has the shiny iTunes look. The experience of browsing through files is simply remarkable. You really feel like you are using something part of the system as Quick Look works and simply double-clicking a files loads it just like the Finder would. A cool feature that I have found is that if you press "Option" and move the mouse over files, a loupe similar to the one in Aperture appears. It is also possible to customize the loupe in the preferences. 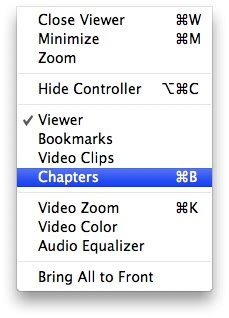 It is possible to get a list of all the chapters without going back to the DVD chapter menu. Using the built-in DVD Player interface is much quicker than using the standard DVD menu. The shortcut is "Command - B". The feature is located in the Window menu. DVD Remaster Pro is part of the MacUpdate 10 applications bundle (more info about the bundle or buy it here). I didn't think I needed this application before buying the bundle, but I must admit, it surprised me. I was already relying on free alternatives like Handbrake, but this application is quite different. It does has features similar to Handbrake, but apparently, you can choose to have a faster encode than what Handbrake lets you do. There is another feature that is particularly interesting. One of the big reason why I needed Toast is for DVD-Rom (UDF). It is not possible to burn a DVD-Rom with just the Finder. It is however possible to do so with DVD Remaster Pro. Another feature that it does is it replaces DVD2OneX, it lets you compress a DVD so it fits on a single layer DVD. I remember years ago when I first studied HTML, the "View Source" feature was the way that I studied. If I wanted to know how someone had done something, I'd check out the source. Of course, nowadays, all the websites use scripts and CSS to achieve what you see on screen. "View source" is now nearly useless. 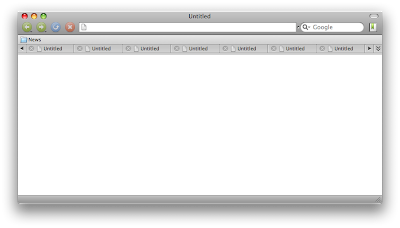 The new Develop menu in Safari has something that I think is pretty cool however. It is the Web Inspector. It does pretty much what "View Source" used to do. It separates everything that is on the website into the following categories: Documents, Stylesheets, Images, Scripts and Other. 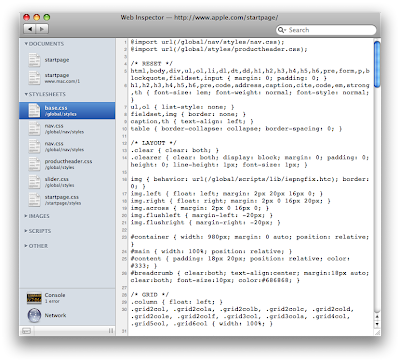 You can find the Web Inspector in the Develop menu. 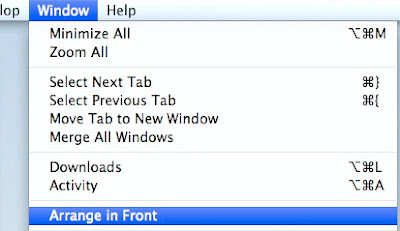 The Develop menu can be enabled in the Advanced tab of Safari's preferences. Getting rid of MenuCalendarClock's icon in the Dock! MenuCalendarClock is part of the ten applications bundle currently on sale at MacUpdate (learn more about the bundle or buy it here). There is one thing that I didn't like about MenuCalendarClock and it is its icon that is always in the Dock and in the Command - Tab dialog. There is no option to get rid of it easily in the Preferences either. It is however possible to easily solve this using the freeware Dock Dodger (more info or download link here). The application still works exactly like it is supposed to, but without the Dock icon. 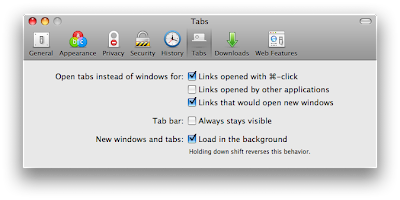 Camino 1.6 was released today and it introduced a new way of dealing with tabs. All the web browsers by default show a pop up menu when there are more tabs in the tab bar than can be displayed. The new version of Camino has arrows on both sides instead. It is not really easy to explain how it works in text, but I think it is a much better way of doing it than Safari. It is definitely worth checking out. 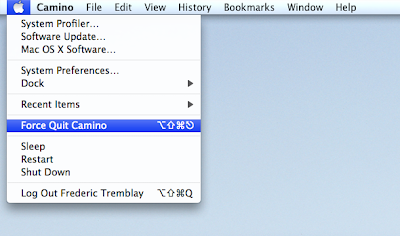 The pop up menu is still available in the new version of Camino. This is a hidden feature from Safari's "Window" menu. By default, it is "Bring All to Front", but when you hold down "Option", it switches to "Arrange in Front". What it seems to do is align all Safari windows in an ordered manner. The MacUpdate bundle is back with ten great applications (once they are all unlocked, it is currently 7 applications). The ten applications usually retail for a total of $474.76 and the bundle is for sale at $64.99. Included in the bundle is Parallels Desktop, Hazel, Art Text, MenuCalendarClock for iCal, Leap, StoryMill, Typinator, DVDRemaster, Sound Studio and BannerZest. I will feature many additional tips this week with tips specifically about the applications in the bundle. The applications that are currently locked are Sound Studio, BannerZest and Parallels Desktop. You can learn more about the bundle or buy it here. I already knew that it is possible to customize the toolbar in Mail but what I didn't know is that it is also possible to modify what columns are displayed. You can choose what columns are displayed by right-clicking on any column (From, Subject, Date Received, etc). 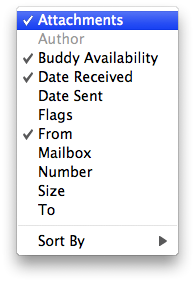 A column in particular that I added is the Attachments column because it makes it so much easier to find emails. It is already possible to switch from one space to another using the mouse if you are also bringing a window with you. If you just want to switch however, you have to use the keyboard (or F8). What if you could just bring the mouse to the edge and it would switch to the other space like a dual display setup. It is very easy to make this possible with an application called Warp. I thought that was cool at first, but it just got too easy and I ended switching accidently. The feature that made it worthwhile is the modifier. You can decide that you need to hold down a modifier like "Command" to switch. I think this makes switching from a space to another much easier. 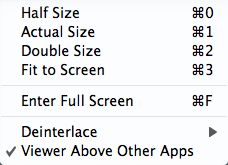 The best is that the application doesn't run in the background, it is totally integrated to System Preferences. 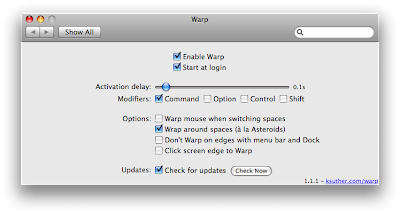 You can learn more about Warp or download it here on MacUpdate. The best desktop ever is really a desktop with nothing on it. That never really happens to me, I actually run out of icon space (even on a 23" ACD). 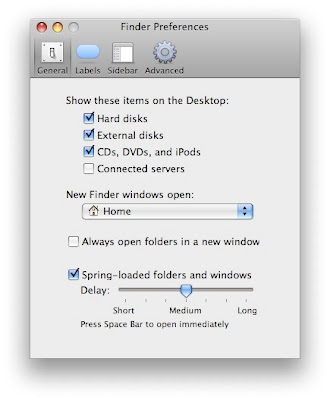 Still, a desktop without anything is really great, but the only way to achieve this is by getting rid of the "Macintosh HD" icon as well as the external drives and CD/DVDs. 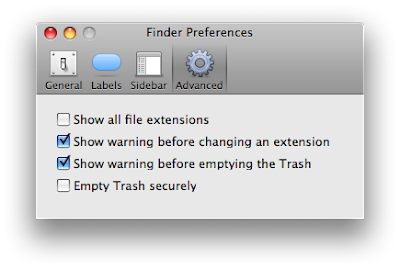 I never got rid of these before because it was the way I loaded new Finder windows. 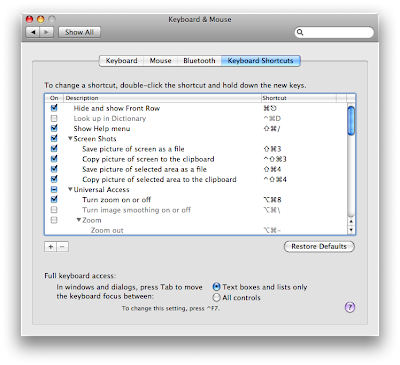 It really isn't as necessary anymore because the Finder sidebar that is included with Leopard already covers all the shortcuts you need. 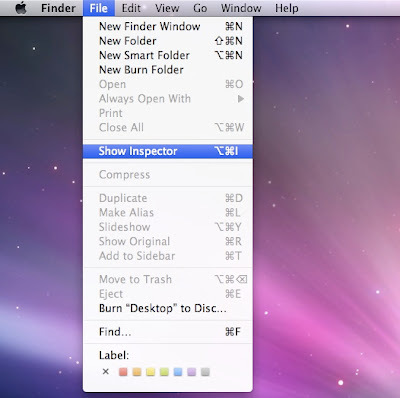 With these icons gone, you can simply load a Finder window with "Command - N" when you are in the Finder. These icons can be disabled in the Finder Preferences (Command , ). Okay, I have to say that I am not an expert in Word Processing, far from it. A lot of people might think this is obvious, but I was so amazed when I discovered this feature last week. It is not new as it is also part of Word 2004. It doesn't seem like Apple brought it to Pages yet though. 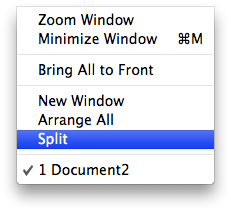 It is the "Split" feature that is in the "Window" menu. 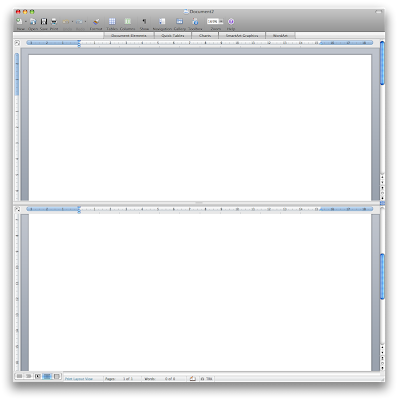 What it does is it lets you browse the same document at two places at once. 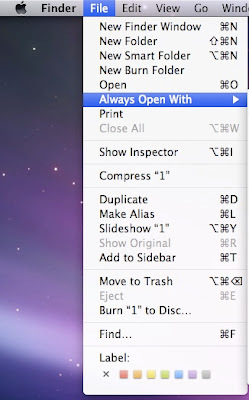 This can be very useful because opening the same document twice is not really an option. Synching is great, but it seems no one actually figured out how to make it work, even Apple. .Mac is pretty good, but it still has synching issues. When everything just doesn't work (you accidentally deleted all your calendar events, you have a bunch of duplicates, etc), it is possible to resolve it by choosing to replace all the data on your computer or all the data on the .Mac server. 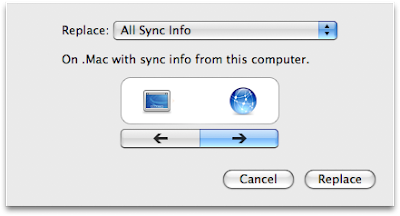 Apple doesn't really makes this obvious, but it is in the dotMac preferences, under "Sync" and in the Advanced section. From there, you select "Reset Sync Data...". 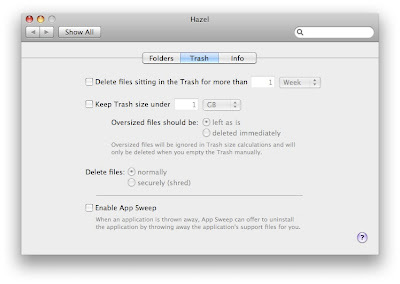 It will let you choose which info to keep and which one to replace (your Mac or dotMac). Holding "Shift" changes another shortcut in the Apple menu. It is the "Force Quit" feature. The standard shortcut is "Option - Command - Esc" and loads the Force Quit window. Adding "Shift" will modify the shortcut and let you directly Force Quit the application that you are currently in. It bypasses the Force Quit window. The System Profiler is the application that has all the info about the hardware and the software. You can already access it through "About This Mac". You can however load it directly from the Apple menu. 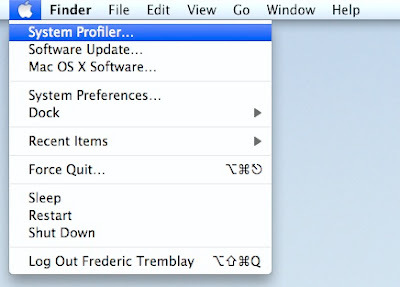 If you hold down "Option", "About this Mac" will change to "System Profiler...". I had issues with my graphics card lately and it is usually fine, except when I am working in really graphics intensive application such as Motion. I read a lot about it online and apparently, replacing the card won't do much good. The reality is that it is overheating. The recommendation were to increase the minimum fan speed when I am working in these applications. A really cool third-party application called smcFanControl lets you increase the minimum speed of the fans. What is great about it is that it is still fully automatic. It will still let the system go above the speed that you set if it is needed. I haven't had any problems since. This application only works on Intel Macs however. 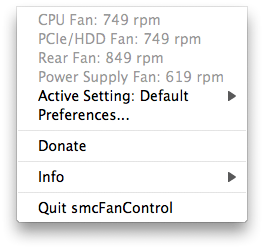 You can learn more about smcFanControl or download it here on MacUpdate. Apple has a feature that lets you choose to have previews from the iTunes store fully downloaded before they start playing. According to Apple, the only use of this is if your internet connection is slower than 128kbps (the encoding of songs). It isn't really useful for me because my high-speed connection is fast enough for audio, but video is not always so great. I didn't always realize it at first, but video previews don't always play for the full thirty seconds because the buffer is not large enough. Enabling this feature solves this, because it lets the full thirty seconds load before starting to play. Apple isn't the best at adding web export to all their applications and it really makes thing easier. The only web export that is implemented everywhere is dotMac. 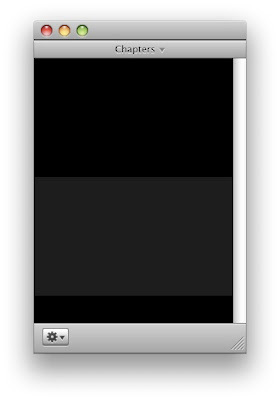 A third-party application somewhat solves this for Photobooth. It is called FlickrBooth 2.1. It adds both Flickr and YouTube export. It only works on the Leopard version of Photobooth. What I really like about these plugins is that it is so well implemented. Once it is installed, it really looks like it is part of the OS. You can learn more about it or download it here from MacUpdate. 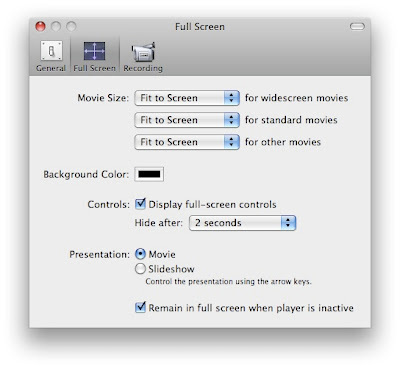 This is a pretty cool feature of DVD Player that ensures that the DVD Player window is always on top. I really don't know if it is Leopard exclusive because it is the first time that I even notice it is there. It is called "Viewer Above Other Apps" and it is in the "View" menu. What I really like about it is that even when it is enabled, you can still hide DVD Player. This is Leopard only. 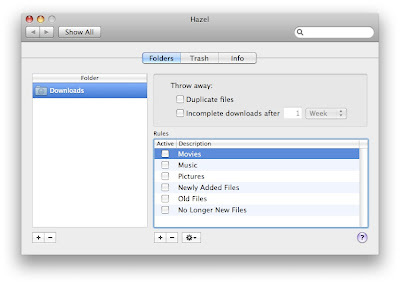 This is a very cool tip that I found out on the Macworld.com video podcast. What it does is it lets you toggle between the time elapsed and the time remaining for a video in QuickLook. It is so simple that I don't really know why I didn't figure it out before this. To switch, you simply have to click on the time elapsed. You can click again on the time remaining to switch back. Thanks to Macworld.com for the tip. A great tip posted in the comments by Louietwoie: Volume adjustments without the sound! I didn't know about this until it was posted in the comments and I think it is pretty cool. It is really useful in presentations. The shortcut that lets you do this is simply "Shift" with the volume adjustments keys. Also, a note about past tips. A lot of comments were about the fact that it is with the "Alt" key instead of the "Option" key. On the Mac, the "Alt" key and the "Option" key are actually the same.